A month back, I successfully completed my first employee central implementation project for a world’s leading bike manufacturer based out of USA. And the entire implementation period has been a great learning experience for me. It has been almost like starting afresh on a new product solution. And here I am, after a long hiatus, to share a knowledge capsule with all of you. Our client wanted to hide the field “Date of Death” in Biographical Information (personInfo) portlet in People Profile for all except HR Admin and HR Technology Support team. Below screenshot shows the field I am referring to. 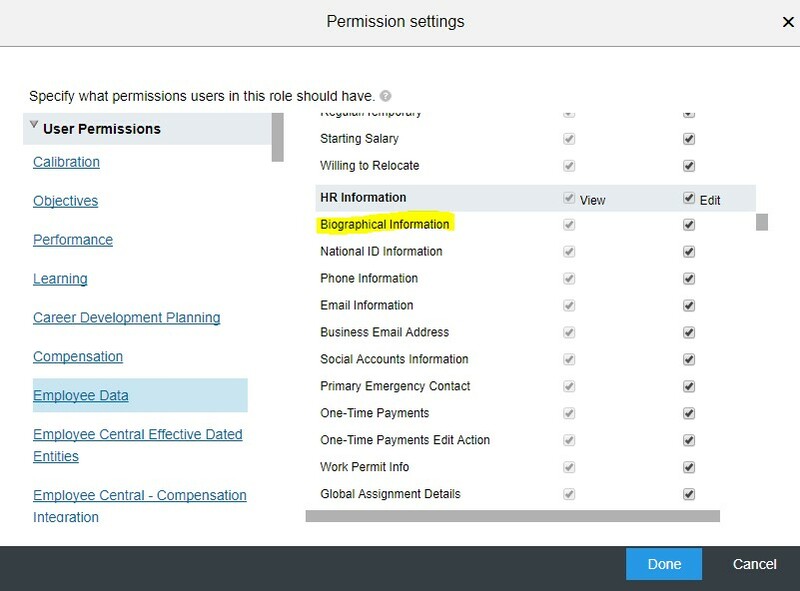 The fields in SuccessFactors are generally hidden using Role Based Permissions (RBP). However, in case of Biographical Information (personInfo) portlet, you can either hide or view the whole portlet using RBP, but not do the same for fields within the portlet. This is because RBP doesn’t provide options for fields within Biographical Information (personInfo) portlet. Please refer the below screenshot for your reference. Since I couldn’t use RBP to restrict visibility of field “Date of Death” in Biographical Information (personInfo) portlet, I leveraged business rule to achieve this requirement. Before that, we need to create a permission group that will include members who will have access to view the field “Date of Death” in Biographical Information (personInfo) Portlet. You can either search for “Manage Permission Groups” in the search bar or follow the below path to open up “Manager Permission Groups”. I created a permission group called “Group_View_Date_Of_Death” and added the eligible members in the group. I have used username as the category for the People Pool for this document. However, I would recommend you to use category like job classification or department etc. to keep the permission group dynamic. Below screenshot shows the permission group I created. The next step is to create business rule using configure business rule. You can either search for “Configure Business Rule” in the search bar or follow the below path to open up “Configure Business Rule”. I created the rule as shown in the below screenshot. Since we have to hide a field in Biographical Information (personInfo) portlet, the base object to be used is Biographical Information (personInfo) Model and not Biographical Information (personInfo). The logic in the rule implies that if the logged in user is not in the permission group – “Group_View_Date_Of_Death”, then the field – Date of Death – is not visible to the user. We need to assign the business rule to the Biographical Information (personInfo) portlet. You can either search for “Manage Business Configuration” in the search bar or follow the below path to open up “Manage Business Configuration”. With this, the solution configuration is complete. Let us test the solution for different scenarios. Scenario 1: User in the permission group “Group_View_Date_Of_Death” viewing “Date of Death” in his People Profile. 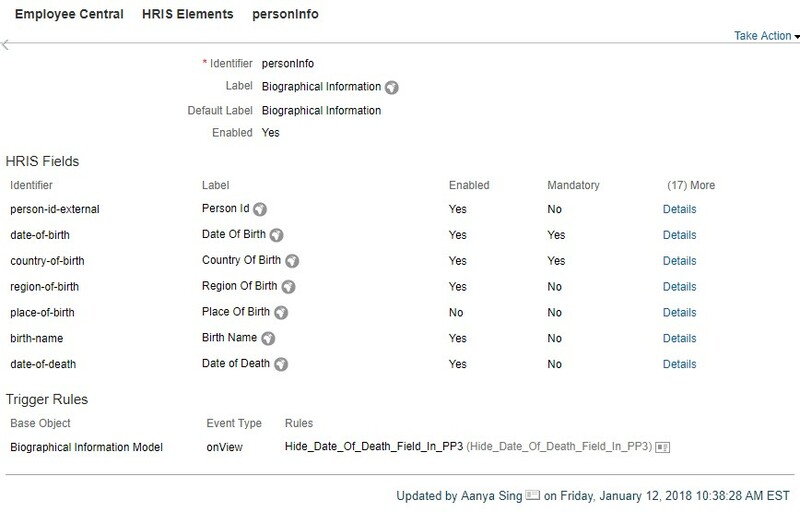 Aanya Sing (username: sfadmin) is a part of the permission group “Group_View_Date_Of_Death” and is able to view the field “Date of Death” in her People Profile. Please refer the below screenshot. 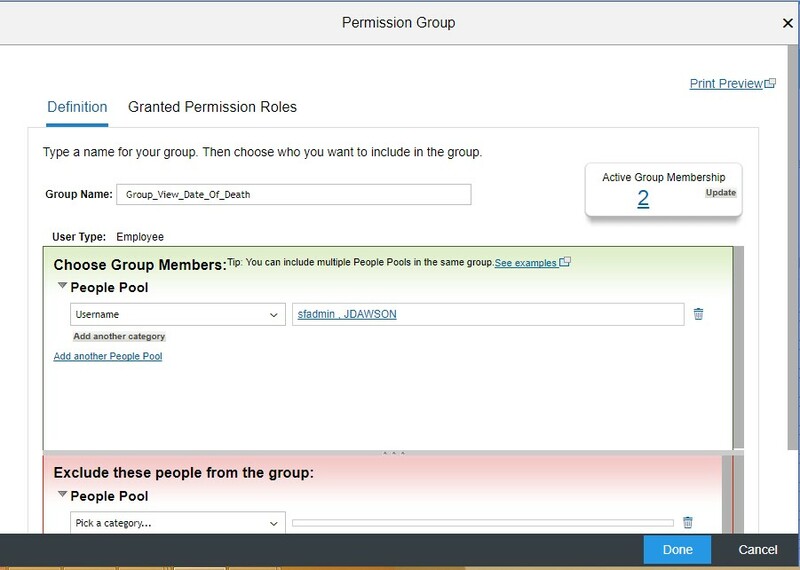 Scenario 2: User in the permission group “Group_View_Date_Of_Death” viewing “Date of Death” in People Profile of another employee. Aanya Sing (username: sfadmin) is a part of the permission group “Group_View_Date_Of_Death” and is able to view the field “Date of Death” in People Profile of employee “Pieter Evert”. Please refer the below screenshot. Scenario 3: User is not in the permission group “Group_View_Date_Of_Death” and trying to view “Date of Death” in his People Profile. Pieter Evert (username: PEvert) is not a part of the permission group “Group_View_Date_Of_Death” and is unable able to view the field “Date of Death” in his People Profile. Please refer the below screenshot. 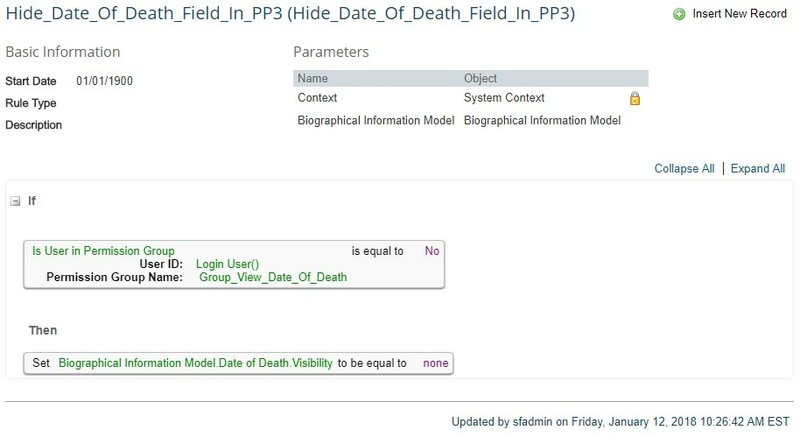 Scenario 4: User is not in the permission group “Group_View_Date_Of_Death” and trying to view “Date of Death” in another employee’s People Profile. Lisa Felix (username: lfelix) is not a part of the permission group “Group_View_Date_Of_Death” and is unable able to view the field “Date of Death” in People Profile of Pieter Evert. Please refer the below screenshot. Here, I come to the end of this knowledge artifact. I hope this solution approach will be helpful to restrict visibility of fields in portlets like Biographical Information. Very useful knowledge artifact. You have clearly explained with the examples on this customization. Thanks a lot for sharing this with the details.